Does drinking wine make you live longer? Does wine will make you live longer? It is a quite important question since man has been drinking fermented grape juice since prehistoric age and wine consumption is still big in many countries. Some scientific researches seem to confirm a link between wine and longevity but, on the other hand, alcohol is well known to be harmful to human health. So the debate is still open and the situation might be far more complex than it seems. Velasquez: Triumph of Bacchus (1629). Detail. Recent archaeological discoveries in Georgia, Armenia and Sicily found evidence of wine production back to an age between 6.000 and 8.000 years ago, which makes wine one of the oldest beverages produced by man. Studies on the DNA of ancient vitis vinifera (wine vine) seeds also show that man had already begun to select vines 9000 years ago. The findings are fragments of terracotta vases on which scientists have found traces of chemical substances irrefutably attributable to the fermentation of grape juice and the preservation of wine. The excavations showed a production of wine that was already quite well organized, so that some archaeologists have even spoken of “prehistoric cellars”. Surely the discovery of wine is much older. The fermentation of sugars is in fact a spontaneous process, which occurs naturally when a sweet liquid comes into contact with air and therefore with the yeasts ubiquitous in the environment. It is not difficult to imagine how man discovered wine by chance in an attempt to transport and preserve the surplus of fruit he gathered when it was most abundant. Accumulated in goatskin and earthenware jars, grapes accidentally crushed, juice dripped on the bottom, maceration started and consequently began the transformation of the fruit sugar into alcohol. And it is even easier to imagine how man then tried to replicate the same process as soon as he realized the intoxicating effects of the drink. The first hangover too must therefore be very old. 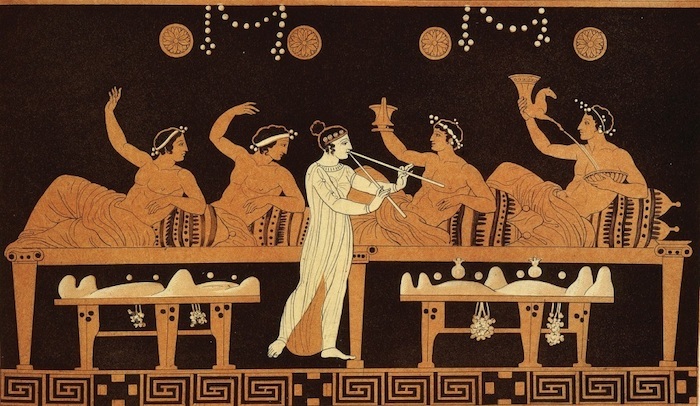 Scene of symposium from an ancient greek vase. In the ancient cultures and religions of the Mediterranean the presence of wine is constant. During the Trojan War the Greek heroes celebrated their victories with great banquets where wine flowed in abundance and in the Odyssey Ulysses manages to escape from the monster Polyphemus making him drunk. 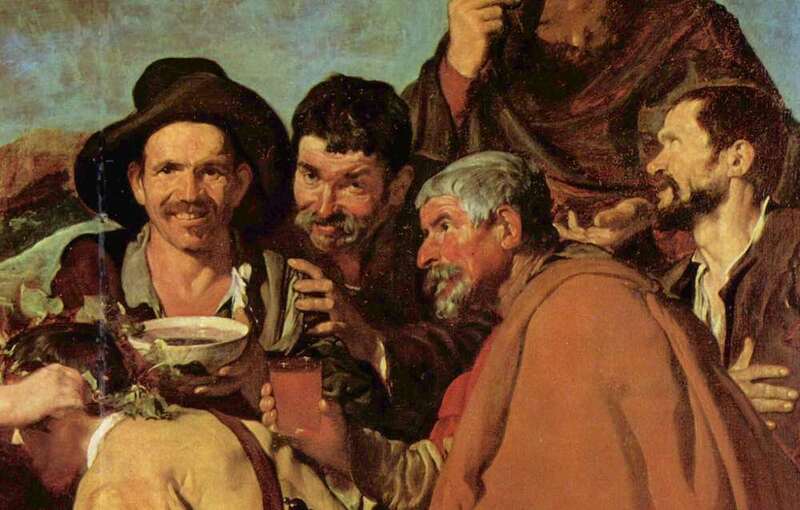 The Greeks and Romans had more than one divinity linked to wine: Dionysus, Bacchus, Silenus, etc. and wine was a fundamental drink in the gatherings of philosophers because they were convinced (and we can’t blame them) that wine encouraged reflection and a warm exchange of ideas. Did you know that the word “symposium” in ancient greek language means “drink together”?! For the Bible, Noah was the first to discover wine, and also the first to get drunk. And wine is also present in Gilgamesh, the oldest poem in human history. Christian religion has done nothing but continue and even strengthen this tie with wine, transforming it into the blood of Jesus. Wherever there was a church there had to be wine for mass and it was thanks to the monasteries that the vine continued to be cultivated even in the dark ages that followed at the end of the Roman Empire. In the Middle Ages, from the lists of provisions for men embarked on vessels for long voyages, we know that the daily consumption of wine per person (although it was lighter than today and was often diluted with water) was about 2 liters! Until not many years ago, in Italy wine was classified as food. In rural society where work was mainly physical, wine provided a valuable source of additional calories. Such and so deep has been the connection between man and wine that it is not surprising that the relationship between wine and health has been investigated several times over millennia. In Italian language there are many proverbs and sayings about how wine is healthier than water. And it’s no wonder. In the past, many diseases and conditions were in fact caused by water. In Roman times, for example, saturnism was quite widespread. The pipes of aqueducts were made of lead, which released its toxic oxides into water. There were also numerous diseases due to mold, bacteria and parasites that infested wells and containers in which water was stored and transported. On the other hand wine, sterilized by fermentation and containing alcohol and tannins that are natural preservatives, was often a much safer drink. 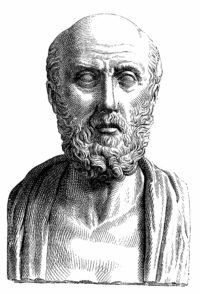 In ancient Greece, Rome and the Middle Ages, there were many famous physicians who described the curative qualities of wine: Hippocrates (460 – 370 BC), Galenus (129 – 200 BC), Pliny the Elder (23 – 79 BC) all agree that wine was very useful for healing wounds, which should not surprise us considering that today we know the antiseptic properties of alcohol. And they also recognize its restorative and febrifuge properties, in some cases even used as purgative and diuretic. In the Middle Ages wine was used to mix in substances, often plants and herbs, which were used as medicines, so as to cover their bitter taste. Wine was also a fundamental ingredient of the theriacs, remedies believed to prevent any disease, very popular throughout Europe. The main ingredient was dried viper meat to which they added other secret ingredients such as bitter herbs and various substances. We can only imagine how disgusting the taste must have been. No wonder they tried to hide it by mixing it in strong wine. One of the most sought-after theriac was produced in Venice where apparently they even added opium to the mixture. There were, however, also those who warned against excessive consumption of wine, such as Androcite, Alexander the Great’s personal physician who, probably after seeing the effects of excessive consumption of this drink on his illustrious patient, said that wine, as well as a remedy, can become the most powerful of poisons. Today tap water is perfectly healthy and we have even too much calories available for our sedentary jobs. Also in Italy, as in the rest of developed countries, wine is no longer considered a food, but it is mainly drunk for the pleasure that comes from tasting it and the euphoria and conviviality that it provides. However, there are still many people who do not give up a glass of wine as an indispensable part of a meal. And we also continue to question the relationship between wine and health, today, however, using the tools available to modern scientific research. The results of many studies and researches conducted on the relationship between wine, health and longevity are however controversial. While it is clear from abundant scientific literature that alcohol, even in small quantities, is harmful to the liver and brain, and can cause cancer, there are studies that seem to relate moderate wine consumption to the prevention of certain diseases and an increase in life expectancy. At the origin of all there is a famous scientific research, that was later named the French paradox. Towards the end of the 1980s, two scientists (Renaud and De Lorgeril) compared the correlation between eating habits and cardiovascular diseases. The conclusions were that the higher the average daily consumption of animal fats, the higher the mortality due to cardiovascular diseases. All 17 countries examined showed the same correlation with the exception of France where, despite the high consumption of animal fats, there was an unexpected low mortality rate from coronary heart disease. In trying to explain this anomaly, the two researchers compared the diet of the populations examined and noticed that the French drank more wine than all the others. The hypothesis was that such a drink could counterbalance the negative effects of too many animal fats. Since the negative effects of alcohol had already been widely documented, the hypothesis was that there must have been other substances in wine responsible for the positive effects found. 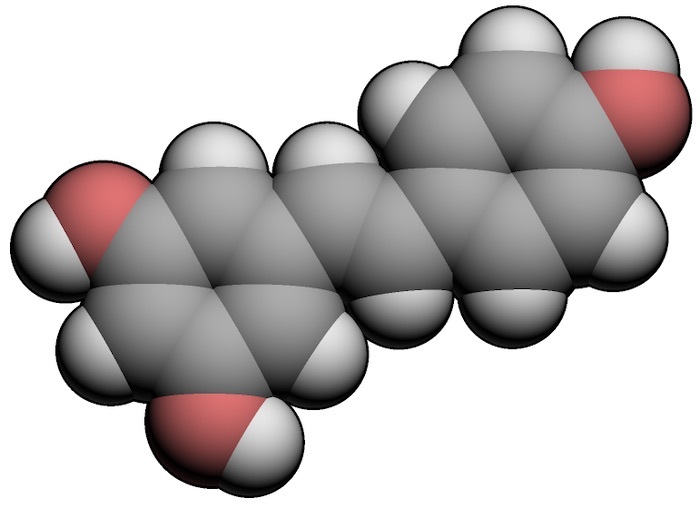 This research led to the discovery of resveratrol and other similar substances, such as piceatannol, pterostilbene, epsilon-viniferine, piceide (glucoside of resveratrol). In grapes and fruit in general, resveratrol is naturally present. It is mainly found in the skin, especially of red grapes where it has an antifungal function. Its content in wine depends very much on the climate, the location of the vines, the techniques of cultivation, processing of the grapes and even on the specific vintage. Climatic conditions that favor a slight fungal attack increase the synthesis of resveratrol in the plant that tries to defend itself. In addition, since resveratrol is present in the grape skin and not in the pulp, its content is higher the longer the wine is left to ferment together with the grape skins. The biological activities of resveratrol are varied and well documented. First of all, from a clinical point of view, its protective action on cardiovascular diseases has been scientifically demonstrated. The substance also has a powerful antioxidant activity. The anticancer properties of resveratrol, supported by several studies, are still awaiting clinical confirmation. Although most of the benefits ascribed to resveratrol have been scientifically confirmed, the high dosages required to obtain such “protective” effects have seriously reduced the enthusiasm for red wine. Even if there is no univocal indication for this, various studies suggest that in order to reach the levels of resveratrol required to have positive effects, the amount of wine intake would be such (several liters per day), that the harm caused by the alcohol would exceed the benefits of resveratrol. 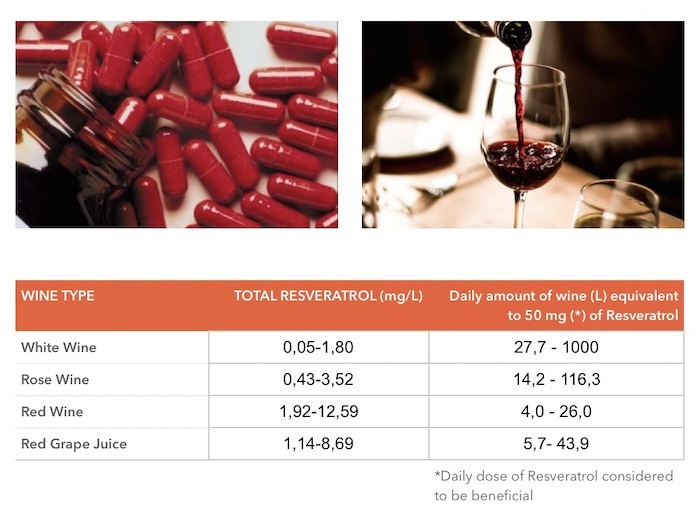 Equivalent amount of wine per 50mg of resveratrol. It would therefore seem vain to hope to exploit the antioxidant properties of resveratrol through the consumption of wine, unless you want to have at all costs an excuse to drink big amount of wine saying that you are doing it for your health. In the meantime, however, rasveratol has ended up in beauty creams and dietary supplements, and the question remains open. On the other hand, it should not be forgotten that wine is a compound of more than 6000 substances including minerals, vitamins, tannins, polyphenols, acids, etc., and that the mechanisms of action of each one and their interactions have not been fully investigated yet. The French paradox was subsequently questioned by many researchers who also accused it of being biased (the researchers were French), and did not fail to arouse controversy, particularly for the use for promotional purposes that was made of it. After the discovery of resveratrol and its benefits, some producers in fact began to advertise wine as a healthy beverage. Which, given the alcohol content, is obviously not. Although a moderate consumption of wine may be healthy, excess is always and in any case harmful to the body. A previous Danish study had already noted a correlation between wine consumption and longevity. This is the so-called Copenhagen study. In 1975 a large prospective study on cardiovascular disease was launched on a sample of 20,000 men and women living in Copenhagen. The study was called “Østerbroundersøgelsen” or, in English, “The Copenhagen City Heart Study”. 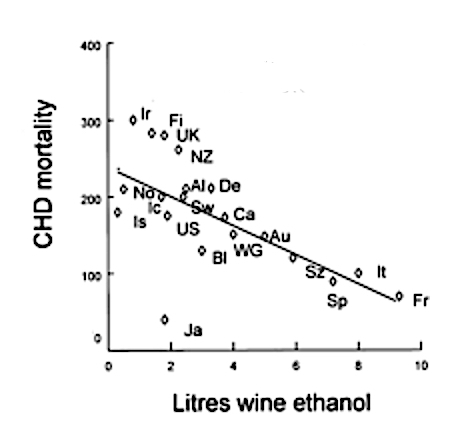 The data showed a negative correlation between coronary and heart disease (CHD) and moderate wine consumption. The original aims of the study were to understand the causes of cardiovascular diseases, such as heart attack and stroke, by analyzing the lifestyle of a sufficiently large number of people. The results of the long study included the fact that wine drinkers had a lower risk of stroke and heart attack than those who don’t drink wine. The greatest benefit was for those who consumed three to five glasses of wine a day, which is much more than the recommended dose of one to two glasses a day that most health experts agree on. The strange thing is that Danes who consumed one to two glasses of wine a day had a significant reduction in deaths, but less than those who consumed a little more. The same study also confirmed previous researches that had found that among those who consume three to five doses of hard liquor a day the mortality rate increases by 30% compared to those who drink none. If we consider that, according to WHO data, cardiovascular diseases, i.e. heart attack and stroke, are the first causes of death in the world, it is not surprising that those who drink wine moderately have a higher life expectancy than those who do not drink it or those who drink spirits. So is there really a correlation between moderate wine consumption and life expectancy? At first glance, it would seem so. Italians, for example, are moderate wine drinkers. Their annual per capita consumption is about 33 liters, which is less than the French and Portuguese (about 43 liters), and more than the Americans (about 10 liters). Life expectancy at birth by country. 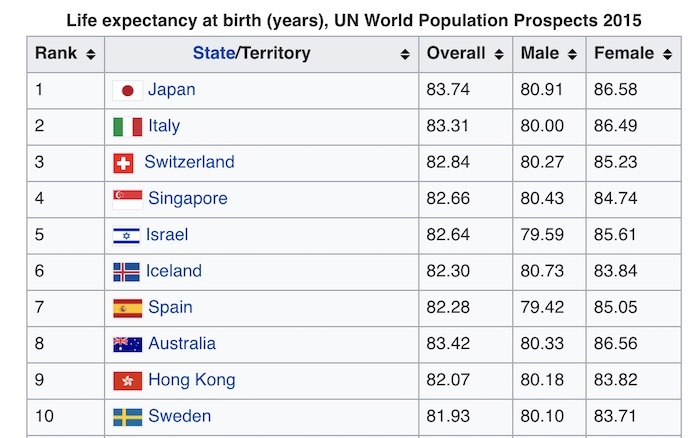 If we look at the list of countries by life expectancy, we notice that Italy is 2nd, with an average life expectancy of 82 years, higher than the French (15th with 81.66 years), Portuguese (49th with 79.01 years) and American (42nd with 79.50). Even if it can be fun to make these kind of comparisons and correlations, and can provide smart conversation topics with friends, maybe at the table in front of a good bottle of wine, in reality things are certainly much more complex. On the other hand Japanese, who are first in all life expectancy lists of countries, even if they have also recently started to consume wine, certainly do not reach the level of Italians, stopping at a modest 2.7 liters of wine per capita per year. Which somehow is challenging the above results. And maybe, right now, there is already some scientist who is doing research on the health benefits of drinking sake. However, even if a moderate consumption of wine (2 glasses a day) can only do good, as ancient Greek, Roman, Middle Ages physicians, popular wisdom and modern scientists seem to agree, it is likely that in determining the longevity of a person are involved many other factors, among which there are certainly genetics, lifestyle, physical activity, access to medical care, and food culture. Which cannot be considered only for the consumption of wine, but in which it is also decisive the type and quantity of fats, sugars, fibers, vitamins, etc., that are consumed. Those who drink wine, are probably more inclined to moderation, they do it more for the pleasure of tasting its complexity, enjoying its scents, its sensations, with the company of friends and loved ones. Compared to those who instead indulge with spirits and are more likely to binge drink. Wine lovers perhaps tend to be more conscious and refined also in other aspects of their diet and lifestyle, and it is the set of all this in the end that probably determines longevity.